Bahacecha – A tribe visited by Spanish explorer Don Juan de Oñate Salazar in 1604. At that time, the Bahacecha were living on the Colorado River in Arizona, between Bill Williams fork and the Gila. Their language was described as being almost the same as that of the Mohave, whose territory was to the north of them and with whom they were friendly. The y lived in low wooden houses covered with earth. Though the Yuman tribes also inhabited that region, they are not identified with them. Bankalachi – A small Shoshonean tribe who lived on upper Deer Creek, which drains into Tulare Lake in Southern California With the Tubatulabal, they constitute one of the four principal coordinate branches of the Shoshonean family. 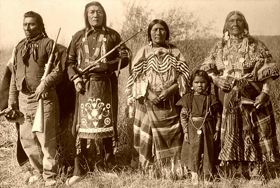 Bannock – The Bannock Indians are a Shoshonean tribe who long lived in the Great Basin in what is now southeastern Oregon and Southern Idaho. Today many of the Bannock still live on the 544,000 acre Fort Hall Indian Reservation in southeastern Idaho, along with the Lemhi and Northern Shoshone Indians. See full article HERE. Bayougoula – Their name meaning “bayou people, the Bayougoula were a Muskhogean tribe located on the west side of the Mississippi River in Iberville Parish, Louisiana. They spoke a Choctaw dialect. Living in thatched-roof houses, the tribe kept flocks of turkey and farmed corn, bean, squash, melons, sunflowers, and tobacco. In 1700 they were said to have numbered about 200-250. Not long after the Bayogoula almost exterminated the Mugulasha as the result of a dispute between the chiefs of the two tribes. In 1706, they received the Tonica into their village but were surprised and almost all massacred by their perfidious guests. Smallpox destroyed most of the remainder so that by 1721 not a family was known to exist. Beothuk – The Beothuk or “Red Indians” were the original inhabitants of Newfoundland, Canada. The Beothuk loved the color red, hence the name. They covered their bodies, faces, hair, clothing and personal possessions with red paint made from a powdered ochre mixed with fish oil or animal grease. Through displacement, disease, and killings by the white man, the tribe died out in the 1800’s. Bidai – The tribe name is Caddo for “brushwood,” probably referring to the peculiar growth characteristic of the region. Extinct today, they belonged to the Caddoan stock, whose villages were scattered over a wide territory, but principally about Trinity River in Texas, while some were as far north as the Neches River or beyond. A creek emptying into Trinity River between Walker and Madison Counties, Texas, bears the name of the tribe. The tribal tradition of the Bidai is that they were the oldest inhabitants of the country where they dwelt. This belief may have strengthened tribal pride, for although the Bidai were surrounded by tribes belonging to the Caddo confederacy, the people long kept their independence. They were neighbors of the Arkokisa, who lived on lower Trinity River and may have been their allies. During the latter part of the 18th century the Bidai were reported to be the chief intermediaries between the French and the Apache in the trade in firearms; later they suffered from the political disturbances incident to the controversy between the Spaniards and the French, as well as from inter-tribal wars and the introduction of new diseases. Little is known of their customs and beliefs, which were probably similar to those of the surrounding tribes of the Caddo confederacy. They lived in fixed habitations, cultivated the soil, hunted buffalo, which ranged through their territory. Early on, they were estimated to number about 100, but in 1776-1777 an epidemic carried off nearly half their number. About the middle of the 19th century, a remnant of the Bidai were living in a small village 12 miles from Montgomery, Texas, cultivating maize, serving as cotton pickers, and bearing faithful allegiance to the Texans. The women were still skilled in basketry of “curious designs and great variety.” The few survivors were probably incorporated by the Caddo. Big Swamp Indians – A name applied to the Seminole Indians, principally of the Mikasuki division, who lived near Miccosukee Lake in what is now Leon County, Florida. Biloxi – A small Siouan speaking tribe, formerly living near the city in Mississippi that now bears their name. Their long lodges had walls made of mud and roofs of bark. After the defeat of the French in 1763, the Biloxi moved into Louisiana, some going as far west as Texas (near Biloxi Creek in Angelina County). Blackfoot – Four tribes make up this powerful Plains Indian nation: the Blackfoot in Montana and the Siksika, Piikani, and Kainai in Canada. The Blackfoot was a nomadic group who’s wanderings took them as far West as the Rocky Mountains and as far east as Manitoba, Canada. 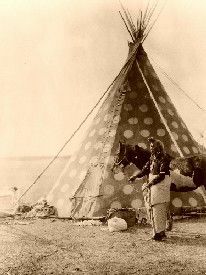 Following the buffalo herds, for which they depended upon for food and clothing, the Blackfoot lived in teepees. Most Blackfoot live in Montana and Alberta, Canada today. See full article HERE.